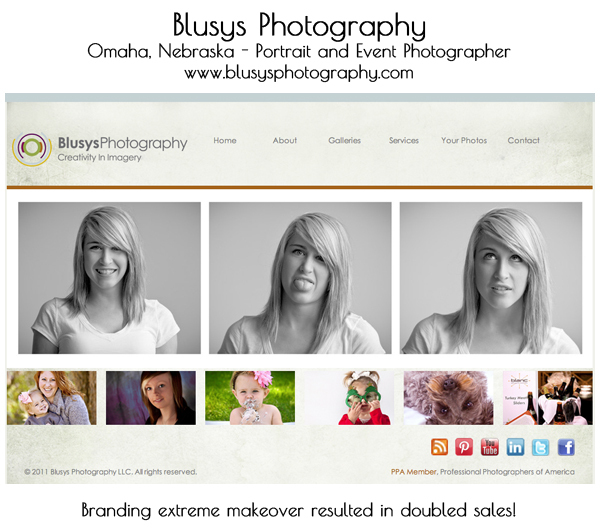 With over eight years of specializing in the design and development of photography websites (with a portfolio to prove it), this blog article provides awesome ideas and examples to bring your photography business to the next level and your web site to life! Get excited because these key points don’t require a degree in rocket science; just a little creativity and a little common sense is all it takes! 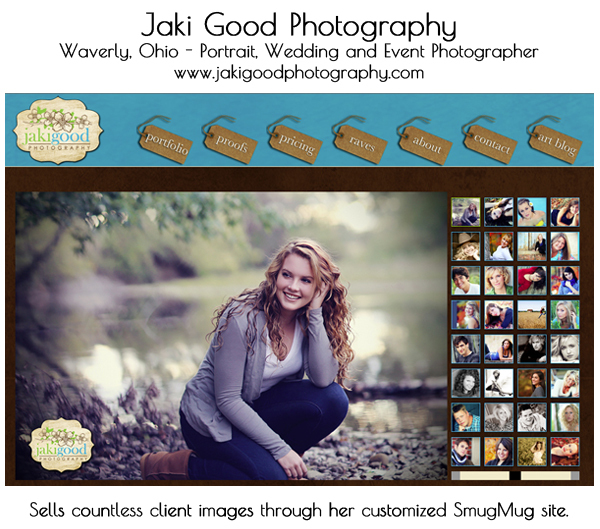 Think of your website as your business card on the web. The first place potential clientele will go is to your website. Having a consistent brand across all of your media such as your website, your blog, your social media, and your business card is necessary. Consistent business literature portrays a high level of professionalism and provides “brand name recognition.” Large companies do it, so why not you? Ever visit a website and the business card and the website look totally different? Ever visit a website and the main site and blog have different logos and color schemes? Consistency is the key to success, and you know the saying – “first impressions count.” Your art is unique and so your website should be too. There are several professional photography online platforms that enable photographers to create client galleries. In turn, clients can view and purchase their images online with a professional print lab, with post-processing offered by the platform itself. 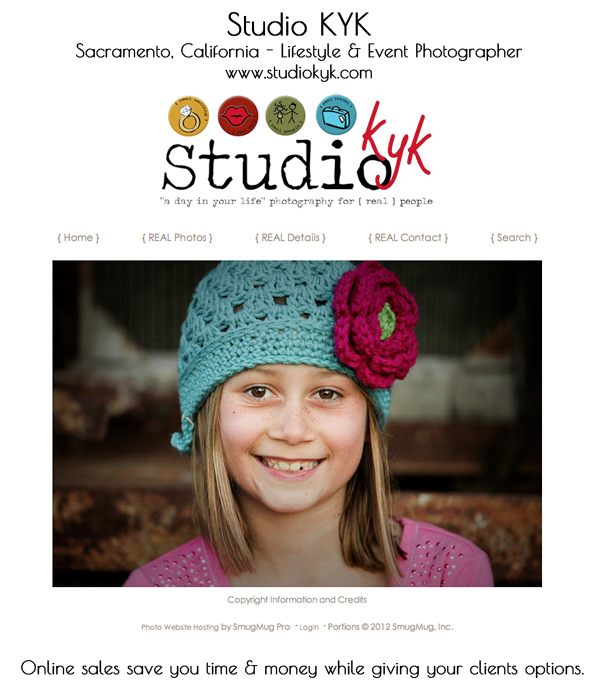 This is a definite “must have” web site strategy for any professional photographer. This is a great tool for post-sales and, more specifically, for friends and family however near or far, to purchase your clients’ prints easily (example – senior picture sales to family members – grandparents and other relatives). A recommendation here is SmugMug, which offers several levels of service and features, as well as post-processing from Bay Photo, EZ Prints, and WHCC labs. 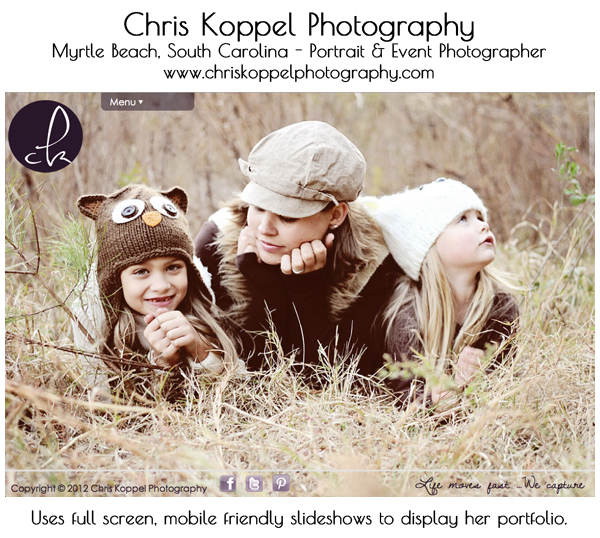 Your portfolio is a great way to showcase your best art to the world! This is what is going to attract future clientele to your business. You know the saying “KISS” – (Keep it Short and Simple)? That is, if you truly specialize in only a few types of photography, then only showcase those few types of photography in your portfolio. 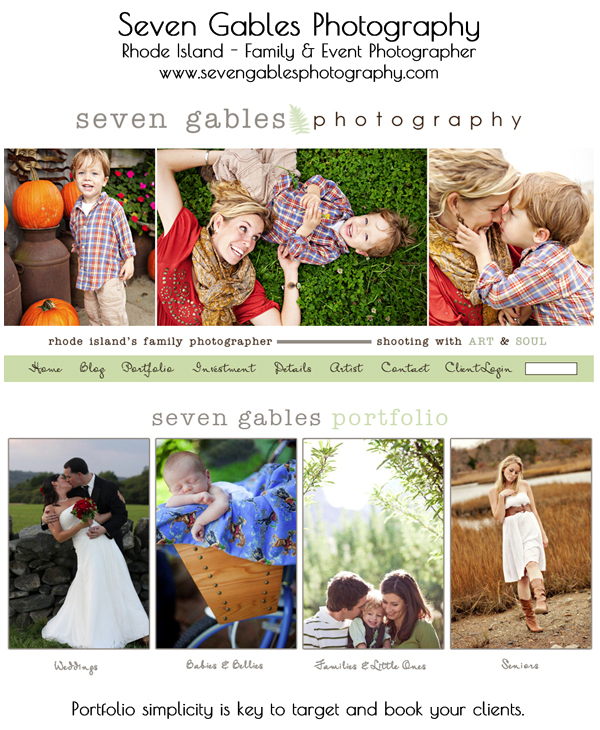 For example, Cathy of Seven Gables Photography specializes in Weddings and Portraits. She divided her portraits into a “Babies & Bellies,” “Families & Little Ones,” and “Seniors” – simple!! 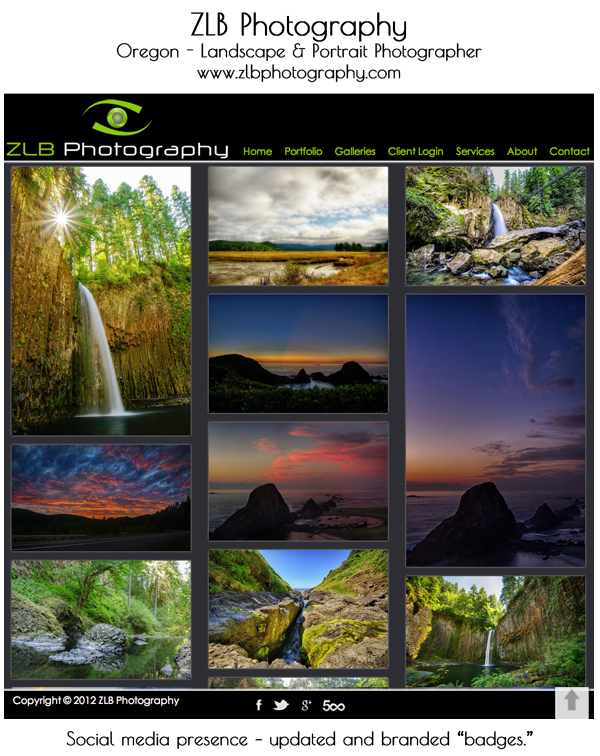 By breaking down her portfolio into these segments it makes it easy for clientele to view specific examples of Seven Gables Photography art as well as making it easy for Cathy to manage her portfolio. 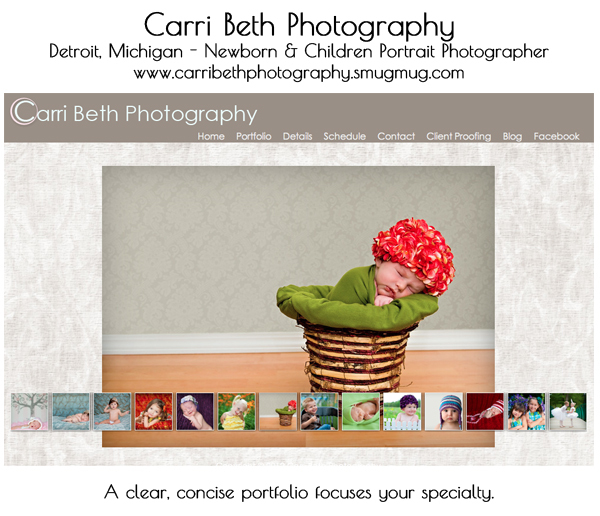 In another example, Carrie Beth specializes in newborns, babies and children – simple as that! If you have too many portfolio galleries, it could confuse your clientele – “what do I look at?” or “wow – there is just too much to look at!” Also, too many specialties in your portfolio leads to a portfolio management nightmare. Answer: The recommendation is enough to fill about 1 minute of time. Example, if your slideshow transition is 3-4 seconds, then 20 images should do the trick. Remember, you have a minute (or less) to sell your ‘style’ to prospective clientele. Answer: A lot of slideshow applications will do a “crop-to-fit” method, while others will display a specific height and width. The recommendation here is simply to make all of the images the same size. Then there are no issues, (this is where your creativity comes in!). It is like reading a book. If the book is 8.5” by 11” and the publishers places a page in the book that is 5” by 7” it will simply throw off the flow of the book. So what do you want to tell the world about you? More importantly, what do your present and future clients want to know about you? There are many different strategies here – how you got involved with photography, a little about you and your family, ten things you like, etc. Creativity counts, so in the age of Youtube and Vimeo the biographies that are a big success are the ones with a video biography. For example, Angela Nivens Rose has a short personal video on her bio page about how she got started as a professional photographer. The viewer gets to know a little bit about his/her photographer and also gets what feels like a face-to-face meeting. This allows your potential clients to immediately connect with you on a much deeper level. With all the social media platforms available, where does one begin? What is a good strategy? How do I manage it all? Answer – just the right ingredients! First, understand your present and future clientele – do they “like”, “tweet”, “circle”, “connect”, “pin”, “blog read” or “all of the above”? Second, truly ask yourself “What social media platforms will you be able to manage as well as keep up with the most”? These are two critical ingredients. If you are not going to keep up your blog or Facebook fan page, then skip it. Having ten links to social media platforms on your site with only three of them you truly keep up to date does not help you at all. Focus on social media that you can successfully keep up-to-date and display those ‘badges’. A question often asked is, “where do I put links to my social media platforms?” Recommendation – use the social media badges since they are recognized by so many. Badges that match your branding are a bonus! Placement on your web site – recommend the header or footer area consistency throughout the site. What is the current trend? According to Hubspot, the social media platforms that drive the most business to consumer conversions are Facebook, your blog, Twitter and LinkedIn (read more about blogging later). Blogging – Sharing your stories.. 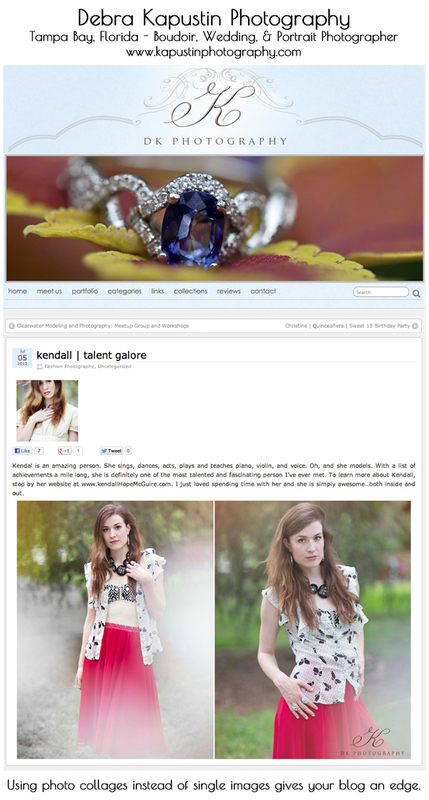 Your blog should match your web site and/or overall business branding seamlessly. Your blog should provide the ability for readers to ‘share’ your blog articles among the social media platforms. Think about the family members of the wedding who will read and share the special day with others. It is important that you share your blog articles on your own social media platforms as well. Work blogging into your overall client session. That is, after you complete your client session and execute any editing workflow, make sure blogging about the session is the next step. Make the article short and sweet by simply praising your client for effortlessness, or his cute laugh. Make sure to add a few of your favorite pictures from the shoot as well! True statement – “a picture is worth a thousand words,” and therefore, tell your blog story through pictures. A great tip here is a simple paragraph or two then provide some ‘teaser’ pictures (like a movie preview). At the end of the article, lead your reader to more pictures via a link to the clients’ gallery. If you agreed with your client to keep their client gallery private/confidential, then simply link to your portfolio so readers can view a showcase of your art. 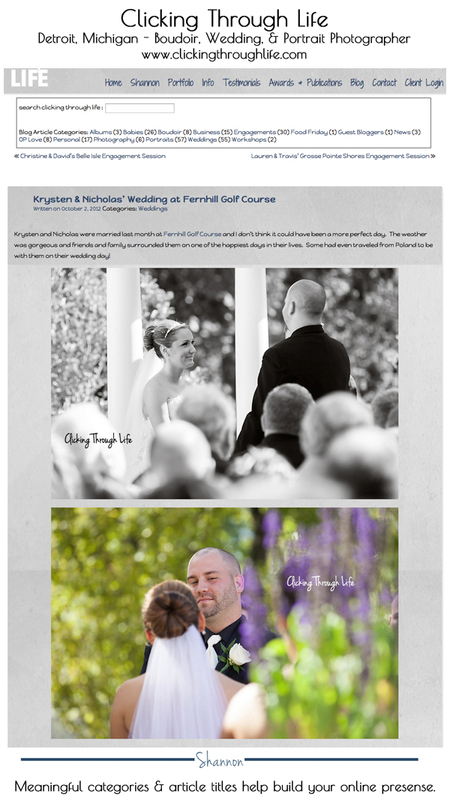 Add some pizazz to your blog article pictures by using templates and actions (see examples in the screenshots below). This also gives some consistency and professionalism to the display of the pictures in the article. Use meaningful categories. This helps with both search engines and keeping your blog organized and updated for your readers. “How often show I blog?” Our recommendation is at least once a week. More blogging strategies and tips coming soon! There are countless, tips, tricks, strategies, PDF’s, training courses, etc. regarding the topic of Search Engine Optimization (SEO). In the spirit of “learning by doing”, one of the most successful tips/tricks is simply adding captions/descriptions and meaningful file names to the images in your blog/web site. Example: A file name of DSC1100.jpeg has no meaning, but a file name of “Tony-and-Carmella-Michigan-Wedding-Photography-Clicking-through-Life-Photography-1100.jpg” gives that image the keywords that the search engines are looking for. In one experience dealing with football photography images, the search engine results prevailed that visits were coming to the site because the images contained BOTH the team names and cities in the file name, and the caption (words such as “Shelby-Lions”, “Romeo Bulldogs”, “Football”). Therefore, before uploading your images, think through consistent file names, tags and captions. jR Customization provides unique SmugMug Customization and WordPress Theme Development for photographers throughout the world. Visit our website for examples and read our blog for numerous customer success stories. This article has great information! I love the examples you posted after each section. Thanks for the tip on a correct way to name the image file! Really enjoyed reading this! Did you do all of those website designs? They are great! thank you for such great information. i always wondered that about SEO and file name. i have questions about tags and categories so off to search your blog! great tips–never thought about the video bio! A lot of great and relevant information here, thanks for collating it. now to put it to use.